Full length pregnancy pillows are specially designed to adapt to the changing contours of your body during pregnancy at different sleeping positions. 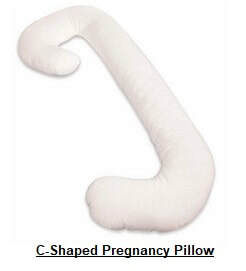 They are made to provide support and comfort to as much of your whole body as possible and are therefore much longer than the regular or wedge shaped pillows (as you will see below, different types of full length pregnancy pillows provide different levels of support and comfort to the various parts of your body)..
Full length pregnancy pillows are particularly useful during the last stages of pregnancy when sleeping in a normal position becomes even harder. Indeed, the increase in body weight creates considerable stress and pressure on the back, hips and legs, and the full size pregnancy pillow will provide support and comfort to these parts and ensure proper rest, relieving pain and suffering. Note that sleeping sideways promotes blood circulation and is highly recommended for pregnant women. However, sleeping sideways can also be very uncomfortable for pregnant women because of belly growth and weight increase. Thanks to their softness and extra padding, full length pregnancy pillows can help pregnant women sleep comfortably in a lateral position, favoring and facilitating blood circulation in the body. Finally, thanks to the increased comfort and relieved pressure and pain, these pillows will allow the pregnant woman to sleep better, more relaxed, and for longer hours, all of which is very important for a safe pregnancy. Note that even after childbirth, these pillows can still be used as maternity pillows to hold the baby in the right position for efficient breast feeding. There is no specific time to start using a pregnancy pillow. One should start using one as soon as changing position while sleeping starts becoming ​uncomfortable. In this article we will compare the three main types of full size pregnacy pillows: Linear, C-Shaped and U-Shaped. We will also recommend the best ones bougt by Amazon customers. 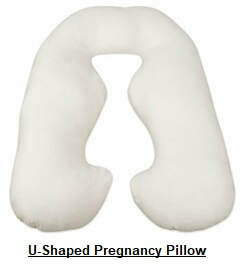 These pregnancy pillows are long and provide a cushion for the whole body. They effectively support the belly and provide good comfort for the arms and legs. Although this type of pillow is nice to hug and and cuddle to, it does not provide much support for the back as it can not be effectively placed behind the back to provide adequate support. But, you can wrap your arms and legs around it by placing your belly in the center of the pillow (see picture). Adjustable to your unique shape to provide comfortable sleep in the postion you prefer. Filled with CertiPUR-US Certified foam, these pillows meet the highest standards for content, emissions and durability, and are analyzed by independent, accredited testing labs. Hypoallergenic and dust mite resistant: allergy sufferers no longer need to compromise comfort. Safe for pregnancy and maternity use. Made of 40% viscose rayon derived from bamboo and of 60% polyester. Machine washable. Comes with a 100-day money back guarantee if you aren't absolutely satisfied. Measures 20 x 54 inches. For price informatin on the Coop Home Goods Memory Foam Body Pillow or to purchase, please see the Amazon Products section below. C-shaped full length pillows provide support for the head, belly, legs and back. To properly use it you simply place the lower end of the pillow between your legs (see photo) in "riding" position for hip and lower back support. You rest your head on top of the pillow and slide your back comfortably into the curve of the C-shape to relieve any pressure you might have on your spine. These pillows are great for snuggling up to and feeling comfortable all night long. They can be true life-savers during pregnancy! Designed to follow the natural contour and shape of your body from head to toe, perfect for sleeping and relaxing. Allows you to attain the position and height that is just right for you. The extra long mid-section is the perfect width for total back or tummy. The slightly curved end tucks snugly between the knees for hip and lower back support. Made of 35% Cotton and 65%polyester. ​Phthalate free, Latex free, Lead free, BPA free. Measures 60 x 24.75 x 7.25 inches​. Weighs 4.8 lbs. Only the cover is machine washable. For best results when cleaning the pillow itself simply spot clean with soapy cloth to remove soils. To clean your removable cover, remove the cover from pillow, machine wash in warm & gentle cycle. Use non-chlorine bleach if needed. Tumble dry, lowest heat setting, remove promptly. For price informatin on the Leachco Snoogle Original or to purchase, please see the Amazon Products section below. The U-shaped pregnancy pillows offer support for the whole body, including the belly and the back, and are suitable for women who prefer to sleep either on their back or sideways (see the images below). Note that U-shaped pillows with hourglass shaped inner curves (see Figure 3 above) adapt even better to your body's natural curves when you sleep sideways, providing even better back and belly support and more comfort. ​The inner contours were designed to follow the natural curved shape of your body. When sleeping on your back, as shown in the picture below, you can simply rest your head on top of the pillow and lay on your back against either side of the U-shape. When sleeping sideways, you can rest your head on top of the pillow and wrap your legs around one side of the U-shape, fitting your back and belly into the inner curves of the pillow for perferct support, and sleep comfortably. ​There's no need to reposition pillows during the night, simply turn from side to side and your body pillow is a custom fit. Body hugging design from head to toe: Hourglass inner curves caress your natural curves. No re-positioning pillows during the night, simply turn from side to side. Comes with a sham-style removable cover. Phthalates free, Latex free, Lead free, BPA free. Measures 51 x 33.5 x 8.75 inches. Weighs 7.04 lbs. For price informatin on the Leachco Back'N Belly Original or to purchase, please see the Amazon Products section below. ​​Please click the pillow of your choice below for price information or to purchase. Note that various colors will be offered when you click the links below whenever available.